NOTE: If you click the arrow and the video doesn’t start playing, click on the screen (or pause button) to pause, then click again to start. Bookmark this page! We’ll put updates here as the comment period ends. If/when the final rule becomes law, we’ll update you on strategy. Once again a regulatory agency is pulling out all the stops to bail out their union benefactors. This time the goal is to put every employer in the country under a “gag order” by forcing them – under threat of criminal penalty – to report things like money spent on supervisory training, attendance at seminars and even employee opinion surveys.On Tuesday the Department of Labor will formally propose a rule change to the Labor Management Reporting and Disclosure Act. 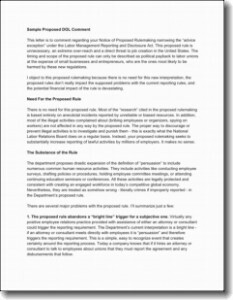 This proposed rule dramatically limits the so-called “advice” exception and means that most discussions about unions between company managers and their attorney or consultant will be subject to public reporting requirements.We’ve read the 160-page document. While we have been anticipating this rule change for many months now, there are several big surprises. • What steps you should take if and when the change is implemented.Come back to this page frequently over the next several months where we will provide updates, suggested scripts and other information.